In 2006, wind-driven electricity powered almost 3 million households in the United States, and this renewable and plentiful green energy source has enormous potential for more. Large-scale wind farms generally group tall, free-standing turbines in a windy area, positioned so that their blades catch the wind and turn, thus generating energy. Oddly enough, wind is a form of solar energy: When the sun heats the earth’s surface, air warms and rises, creating different degrees of air pressure, which creates wind. 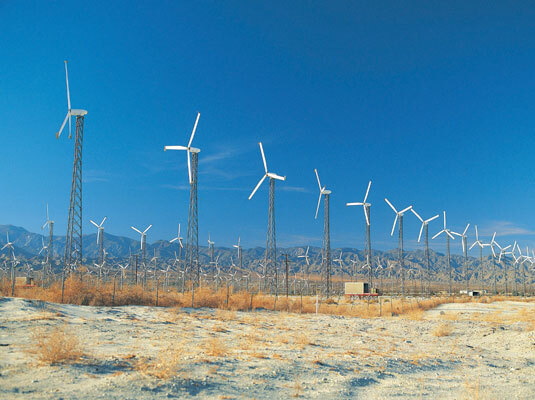 Wind farms generate controversy along with energy. Critics cite noise, visual impact, and their effect on birds and bats as reasons not to build them. However, the industry is addressing the noise and environmental concerns by way of technological developments that have reduced turbine noise and by locating the turbines where their impact on wildlife is reduced. Wind farms certainly have pros and cons. To put bird deaths due to wind turbines in perspective, the National Wind Coordinating Committee reports that 1 out of every 5,000 to 10,000 bird deaths in the United States each year is due to collisions with wind turbines. It also reports that although that figure may seem small, all efforts to reduce fatalities are important. Wind power is ideal for pairing with another renewable energy source because it’s intermittent. For example, the wind often blows at night or during stormy weather, generating electricity when the sun’s not available to power solar energy options. When it’s a sunny, windless day, solar energy sources can pick up the slack.